This is another request from a former co-worker. She is very religious and requested the lion with a crown because Jesus Christ is referred in the Bible as a lion. This is her inspiration for having me make the lion. Before anyone comments, the pattern materials list calls for coffee brown and the main and tail end are purple because that is what was requested. Worsted Weight yarn: Taupe, white, black, gold, and coffee. Finish off leaving a long tail. Stuff HEAD firmly. Finish off leaving a long tail. Sew MUZZLE to HEAD stuffing before closing. Rd 4: (sc in next 5 sc, 2 sc in next sc) around. (14) Change to taupe. Finish off leaving a long tail. Sew MANE CAP to HEAD. Finish off leaving a long tail. Sew EARS to MANE CAP. Fringe on 4-inch pieces of coffee working around MANE CAP and EARS. The creation of the MANE is time consuming but gives you the best effect. Finish off. Stuff BODY firmly. Weave in ends. Sew HEAD to BODY. Finish off leaving a long tail. Stuff LEGS firmly. Sew LEGS to BODY. Using coffee, embroider toes dividing lines on LEGS. Finish off leaving a long tail. Stuff ARMS firmly. Using coffee, embroider toe dividing lines on ARMS. Sew ARMS to BODY. With taupe, embroider EYELIDS on HEAD. These should appear like the eyelid, almost making him a droopy eyed lion. Finish off leaving a long tail. Stuff TAIL lightly. Sew TAIL to BODY. Fringe 4-inch pieces of coffee to Rds 1 through 3 of TAIL. Rd 3: Ch 1, turn; [sc in next sc, hdc in next sc, (dc, tr) in next sc, ch 3, slip st in top of tr, (tr, dc) in next sc, hdc in next sc] around. Finish off leaving a long tail. Sew side of Rws together. OPTIONAL: Embroider jewels on CROWN. 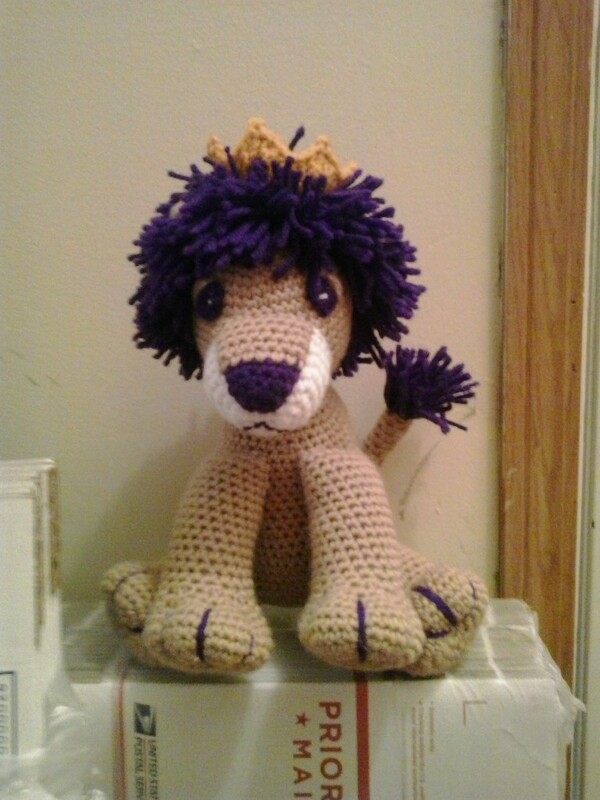 Sew CROWN to HEAD of LION over MANE. This crochet pattern is an original pattern and is © by Christjan Bee (June 2018). Please do not claim this pattern as your own. If you wish to share this pattern, you may link to this pattern but please do not reprint/repost it on your site. You may print and keep a copy for your own personal use; but you may not sell or distribute it, or sell items made from this pattern. Wow! This is well done. Thank you for sharing this with us! You make me want to finally learn crochet. Mind, I've tried before. . . with comical results!